The first thing you see are a couple of colorful pages. The first is a cute little cartoon about Japan Crate getting new offices (not SURE we care about that, but let’s go with it) and the second is an important and smart part of what they offer: an explanation and description of everything in the box. This turned out to be invaluable to me. Now we can actually see the goods, but…let’s give things some space. And here it is. 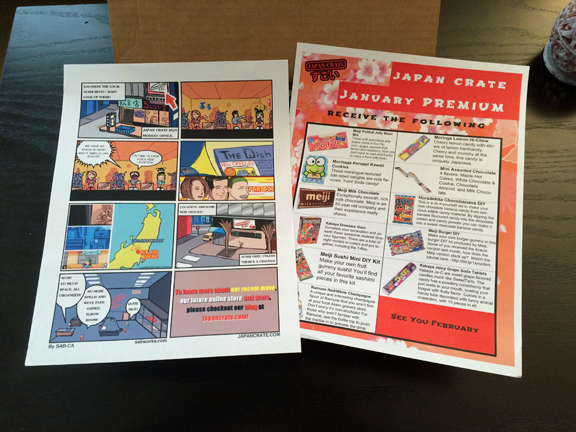 The January offering from JapanCrate.com. Before we go any further, I want to make it clear that there’s two different things to review here: the service, and the candy I got this month. As for the service…I’m really impressed. There’s no way you or I could order all of this stuff and get it for $30 including shipping. Even more impressive is the curation: these people hand picked these items to provide a variety, and they nailed it. Going a step further, they have a blueprint: a certain amout of full sized candies (no sampler sizes), and on the larger boxes, DIY candy kits, and in the largest, a drink. So while you sorta know what kinds of things you’re getting, you never know exactly what those things will be. 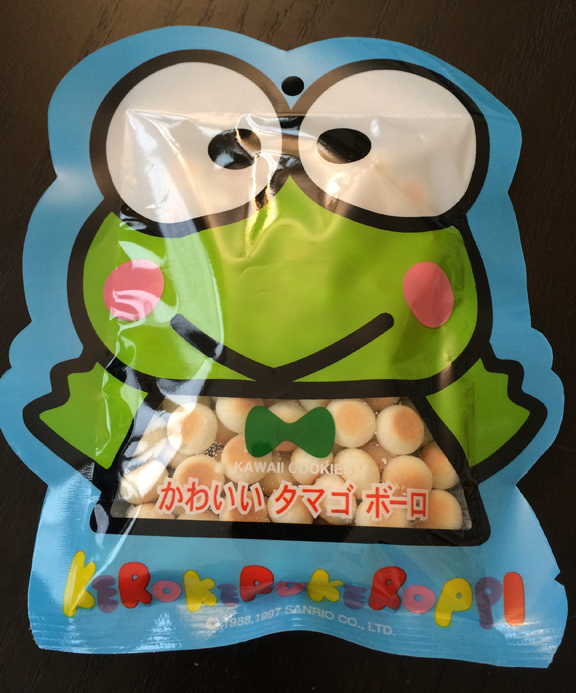 If you’re a fan of Japanese sweets & candy, then this is for you. Even if you don’t know if you are, this is a great introduction, and you can cancel any time, so there’s really no risk. There’s a lot of subscription boxes out there, and an increasing number of candy related ones are popping up daily, it seems. I love that this one is so specific, and clearly, they know what they’re doing. 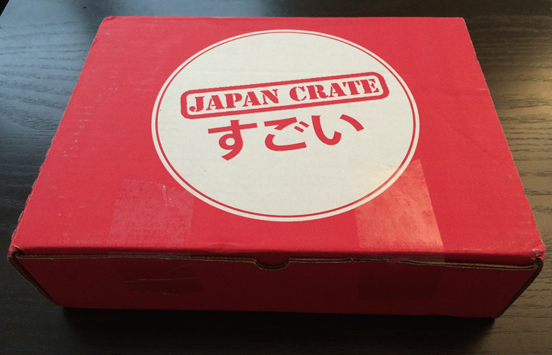 Bravo, Japancrate! 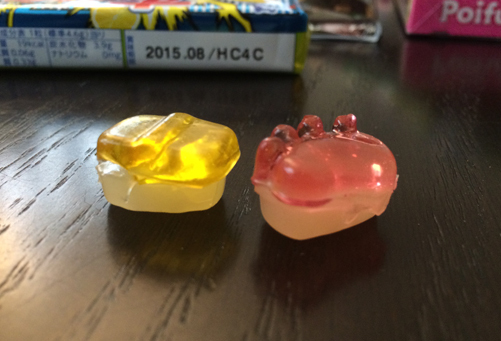 Now..let’s move on the candy itself. Wow. Lots of things to cover here, so let’s start at the top: how about cola flavored cookies? Cookie bites? Trippy. Not sure the cola taste jumped out at me, but again, thanks to the legend sheet, I know they’re cola flavored. Not my favorite, but then again, I’m not a huge cookie guy. What’s next? 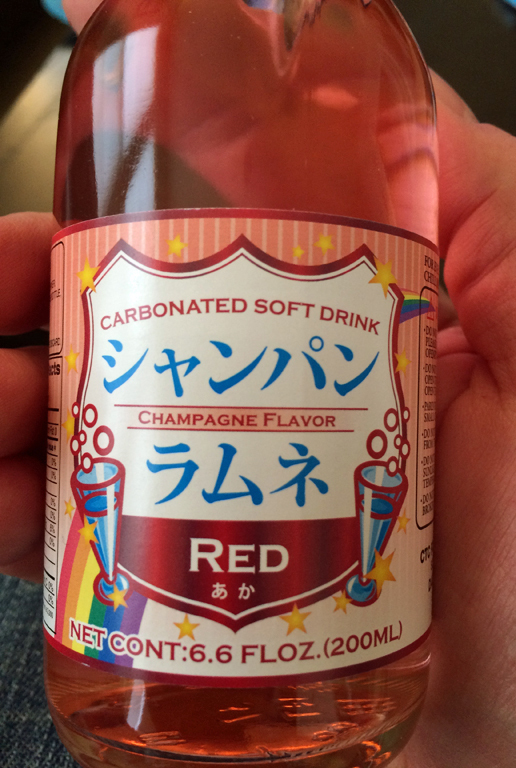 Refreshing champagne flavored soda, anyone? Perhaps to pair with cola cookies? Let it be known that first, I don’t really like these sodas. They’re ayeet, but generally I’m not into the novelty ball that in theory controls how hard you can chug it. Also, the flavors aren’t usually my thing- and this one, although subtle, falls right into that category. Moving on! Sushi, anyone? This is the first of three DIY kits I got. I haven’t had a lot of experience with these things, so I was definitely interested. 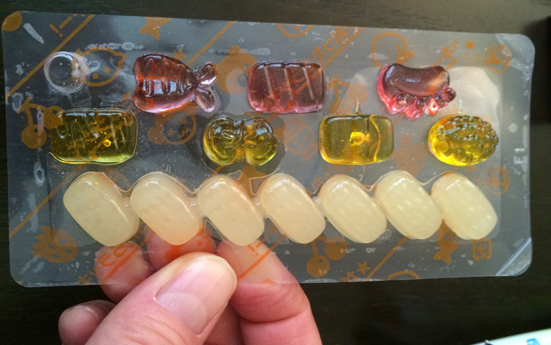 …you’re eating candy sushi like a boss. Very yummy, these were, very bright & good flavors. But I was Manw ich-style hungry, a little sushi just wasn’t gonna cut it. Enter…burger time DIY. 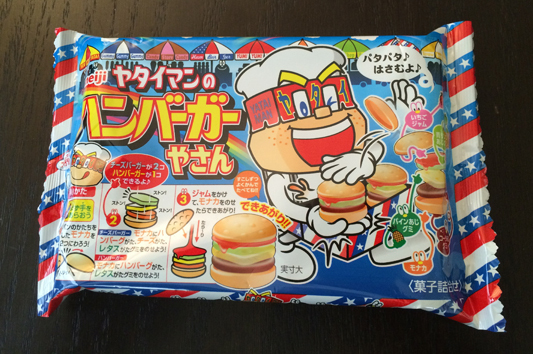 Inside, the gummy patty, lettuce, cheese, etc. 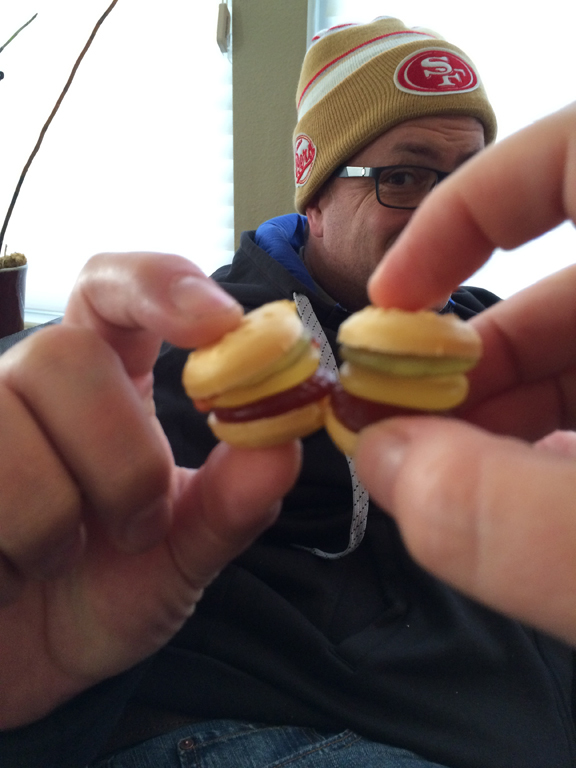 Once you stack them on the oddly savory light cookie-like bun, you get a packet of berry flavored “ketchup” to splash on top. FUN TIME! 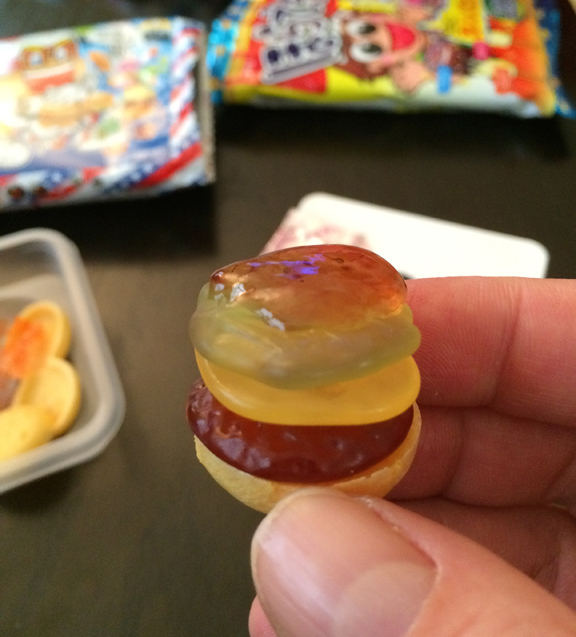 The gummies and the berry ketchup were good-very good, actually But the weird cookie/cracker buns took it in a savory direction, and I’m not sure how well that worked out. Not bad though. 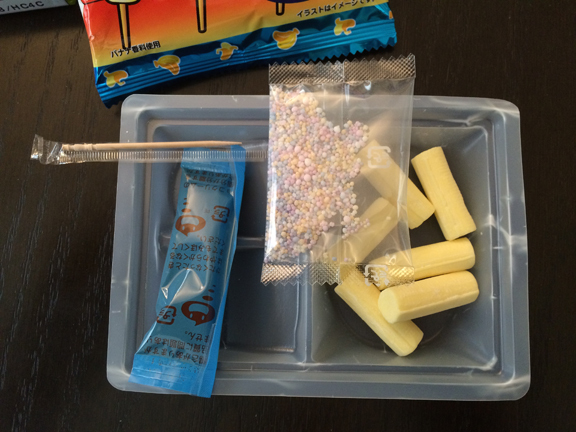 Next up, the last DIY kit, a chocobanana! You take the toothpick on the left, and spear it lengthwise into one of the soft banana-like chunks. 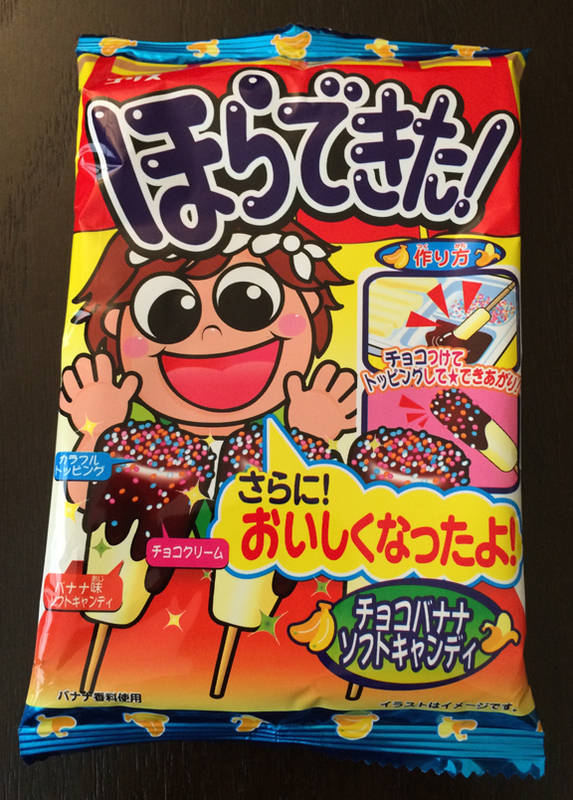 After pouring the fudgy chocolaty goo in the plastic tub on one side, and the candy speck coating on the other, you dip the banana in the chocolate, then the specks, and viola-chocolate covered banana. I just didn’t have the energy to do it though, I’m old. Oh no big deal. 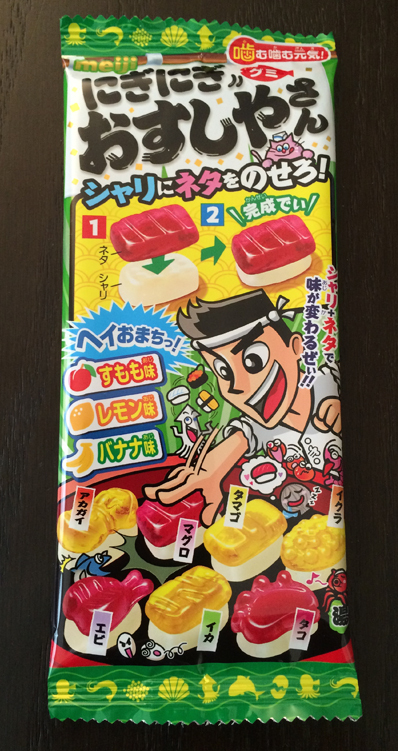 Just lemon Hi-Chews from morinaga with chunks of hard candy inside. I didn’t try these and I don’t need to, in order to know that they’re AMAZING. Never seen them before, and am really looking forward to eating the whole thing in one sitting. EDIT: I caved and opened these yesterday. They’re even better then I suspected- it’s like hard candy was shattered into a million shards, and they were all evenly dispersed thoughout the chew. 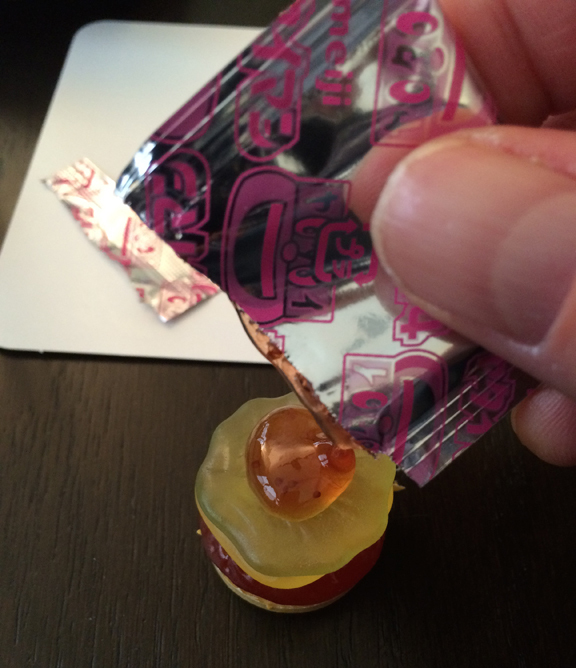 Delicious lemon flavor- both the chew and the hard candy- abound, and the crunch is crazy. Awesome! Ditto for these, on the don’t need to taste to know I love them thing. Juicy grape soda tablets-enough said, I’m in. The Japanese own grape flavor, and I love anything fizzy/sour, so again, not even worth pontificating on. These WILL be amazing. And I won’t share! 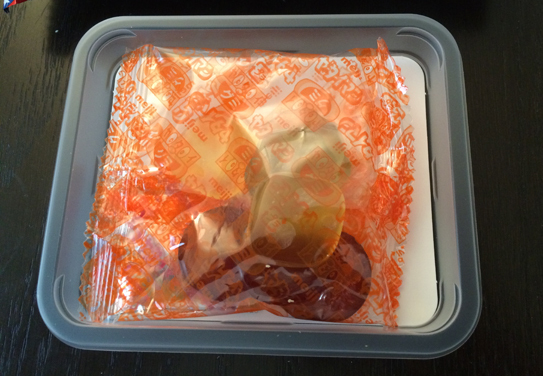 Finally, this thing was billed as Kabaya Dinosaur gum- and the gum was great. Banana flavored, lasted at least 30-40 seconds. 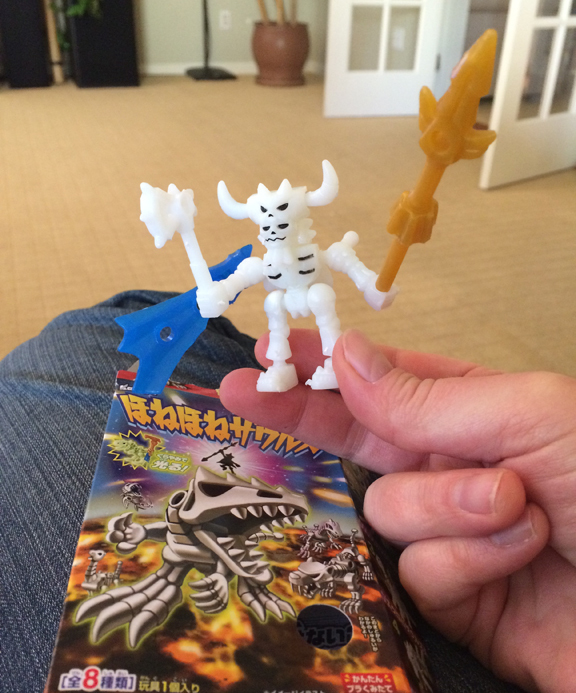 But the real allure was a model-like kit of a bizarre glow in the dark warrior dinosaur. 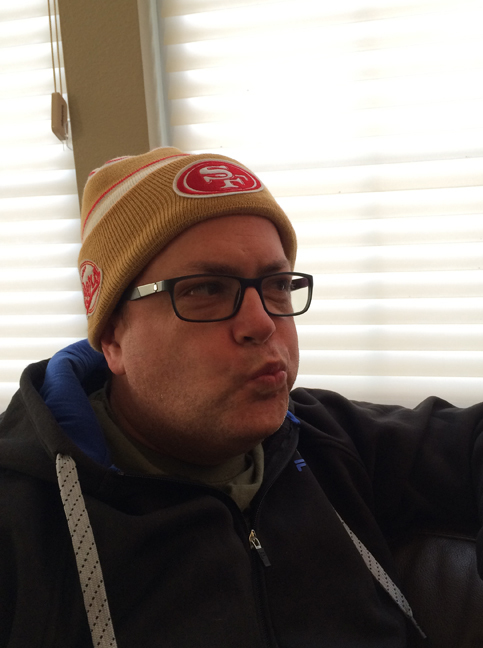 I built it, and my Guru Jr. immediately adored it. It’s found a new home alongside his Lego & Halo action figures. 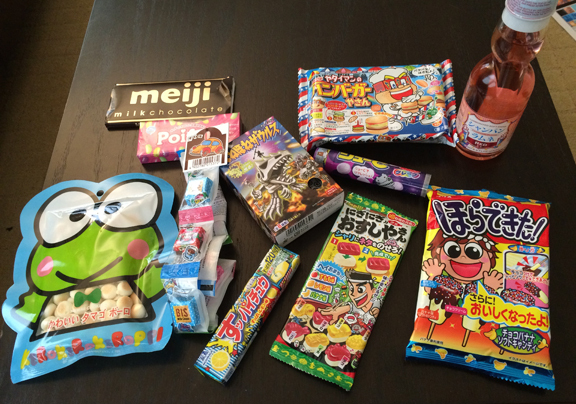 All told, I was seriously surprised at the overall quality and thoughtfulness of Japan Crate’s offering. There’s a few things in there that I didn’t discuss, which lets you know just how much value you’re getting for your buck. 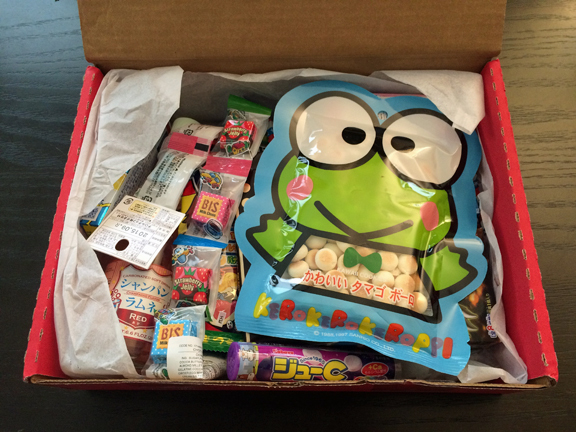 I can honestly say that Japan Crate is the best candy subscription service I’ve seen yet. Click the link below to check them out, and remember, there’s no commitment, you can cancel whenevs. Give it a try, and hopefully you’ll get some burgersushibananadinosaurs too. is it suitable or vegetarians? Certainly not every item is-you’d have to check directly with the kids at Japan CrAte.